About 10 years ago I realized that there wasn’t enough pizza or beer in the world to properly thank friends for lugging my stuff from one apartment to the next. Moving is at best cathartic, but generally it’s chaotic and just not a mess that I want exposed. We moved recently and our wonderful friends and family of course asked how they could help. Aside from extra boxes (thank you Katie!) the answer was coffee. I discovered this because of the kindness of Erin S. in Chicago on the day we packed up and left that city. Our home––the scene of so many warm, hilarious nights with friends–– was a depressing hollow shell, a daunting cross country drive threatened and stress levels were elevated. Erin showed up just in time with dark, caffeinated sustenance. Bless you. Our most recent move was only a few blocks away, but still stressful. Our friend and neighbor, Sue, delivered coffee and hung around to offer a very pleasant (and necessary) distraction. It absolutely made our day. I wish I had learned this secret to easing transitions and helping out on move day sooner. Call me when you move, I promise to bring the coffee. 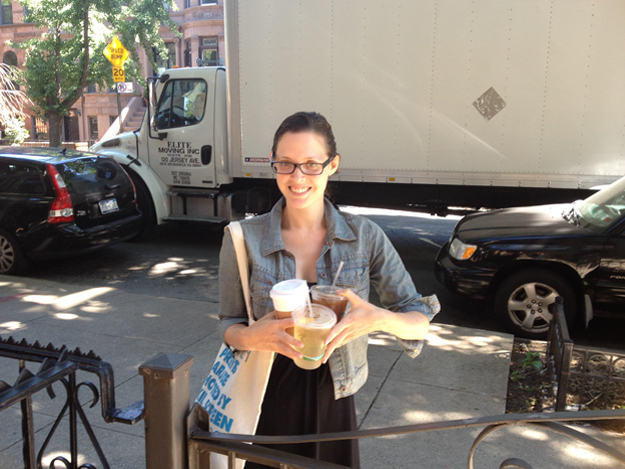 This entry was posted in Ps&Qs and tagged coffee, moving day by lhouse. Bookmark the permalink.